Computer programming is the designing and writing of source code for computer software; code is the building block for every piece of technology around us. A growing, coordinated effort to build “code literacy” has gained momentum in recent years with the launch of numerous local workshops and free online programs aimed to teach anyone any kind of programming language. All this activity has raised important questions concerning how we interact with our increasingly programmed world. This August, Rhizome is pleased to host Kitchen Table Coders Presents: Learn to Code from an Artist. This is a two-part event: the first part is a panel discussion, the second is a workshop exploring the practice of teaching and utilizing code in an artistic context. The event will take place over the course of two days in the New Museum Theater. In this first event, the Kitchen Table Coders will present their teaching philosophy and methodology, which emphasizes collaborative learning experiences by blurring the line between student and teacher, and will discuss the issues and trends in code and computer literacy in the arts with a panel of educators and artists in the field. Panelist include Amit Pitaru of Kitchen Table Coders; Jer Thorp, artist and educator; Sonali Sridhar of Hacker School; Vanessa Hurst of Girl Develop It and Developers for Good; and moderated by Douglas Rushkoff, Code Evangelist for Codeacademy, educator, and author of Program or Be Programmed: Ten Commands for a Digital Age. The following day, small Kitchen Table Coders-style workshops, hosted by artists working with code, will provide a gentle introduction to the basics of code and programming. Space is limited and seats are on a first-come, first-served basis. 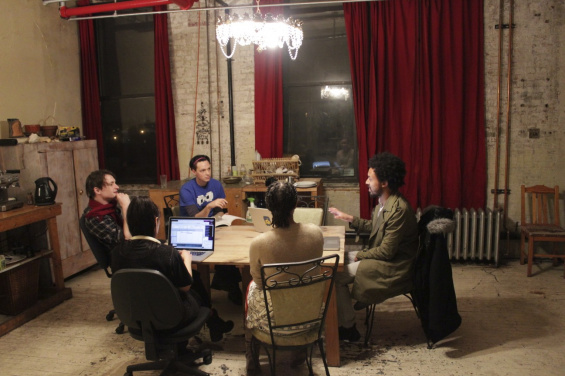 The Kitchen Table Coders are Amit Pitaru, David Nolan, Jeff Crouse, Tims Gardner, and Ted Hayes—a group of professional programmers with a passion for knowledge sharing, began to host small workshops around a kitchen table in their Brooklyn studio space. Open to anyone interested in learning code, the Kitchen Table Coders keep their workshop classes small to create personalized and collaborative learning experiences. Pitaru is the cofounder of Kitchen Table Coders. His work spans experimental art, research, education, and entrepreneurial projects. As an artist, Pitaru develops novel instruments and methods for making music, animation, and dance. His work has been exhibited at the Design Museum London, the Centre Pompidou in Paris, the Lincoln Center in New York, Sundance Film Festival, and the NTT InterCommunication Center in Tokyo. Pitaru is a recipient of a MacArthur grant for documenting his work in the field of assistive technology: “Making everyday software and video games more accessible to children with disabilities.” His writing on this subject was recently published by MIT Press. As an educator (at New York University ITP, Cooper Union, and SVA Interaction Design), Pitaru develops curricula that focus on the coupling of technology and the creative thought process. Thorp is an artist and educator from Vancouver, Canada, currently living in New York. Coming from a background in genetics, his digital art practice explores the crossovers between science, data, art, and culture. Recently, his work has been featured by the Guardian, Scientific American, the New Yorker, and Popular Science. Thorp’s award-winning software-based work has been exhibited in Europe, Asia, North America, and South America, including in the Museum of Modern Art, New York. He is currently Data Artist in Residence at the New York Times and is an adjunct professor in New York University’s ITP program. Thorp is a member of the World Economic Forum’s Global Agenda Council on Design Innovation. Hayes Tedb0t is a hacker-poet, conceiving objects and experiences that explore the sublime and the enigmatic through recombination, emergence, and deconstruction. He is a proponent of what he has dubbed “Research Art,” or art as science experiment: a work driven by questions but without obvious conclusions, raising new questions while enveloping and engaging the audience. Hayes’s works range from a group of language-inventing robots to a mythological city-founding ritual for a soprano and string quartet. He is a graduate of New York University’s Interactive Telecommunications Program and is the recent recipient of a New Radio and Performing Arts commission. Hayes has spoken on the subject of Research Art and Language Machines at TEDxGallatin, Crossing Art gallery, and Dorkbot, and his work has been shown and performed at Grounds for Sculpture, TEDxBrooklyn, the Chelsea Hotel, ISSUE Project Room, NYCAMS Gallery, 319 Scholes gallery, Theatre Lab, Monkey Town, and Brooklyn Bridge Park. Seward is an artist and programmer. His work has been exhibited at the Blanton Museum of Art, Austin, CVZ Contemporary, New York, Center For Opinions in Music and Art, Berlin, and Nova Scotia College of Art and Design, Halifax. He has lectured at the Centre Pompidou in Paris and Columbia University and Location One, both in New York. He holds a Master’s from the Interactive Telecommunications Program (ITP) at New York University’s Tisch School of the Arts. Before getting his Master’s, he worked in collaboration with composer Fred Lerdahl, creating software based on the Generative Theory of Tonal Music. Seward lives and works in New York City. Organized by Rhizome, the New Silent Series receives major support from The Rockefeller Foundation, and The Andy Warhol Foundation for the Visual Arts. Additional support is provided by the New York City Department of Cultural Affairs, and the New York State Council on the Arts.